Home News Breaking News Can Food Labels Kill Added Sugar? Sugar is everywhere in the American diet, and now the Food and Drug Administration will begin highlighting just how much of the sweet stuff is added to what we eat. Beginning in July 2018, the “Nutrition Facts” labels on packaged foods will list added sugars separately from total sugars. 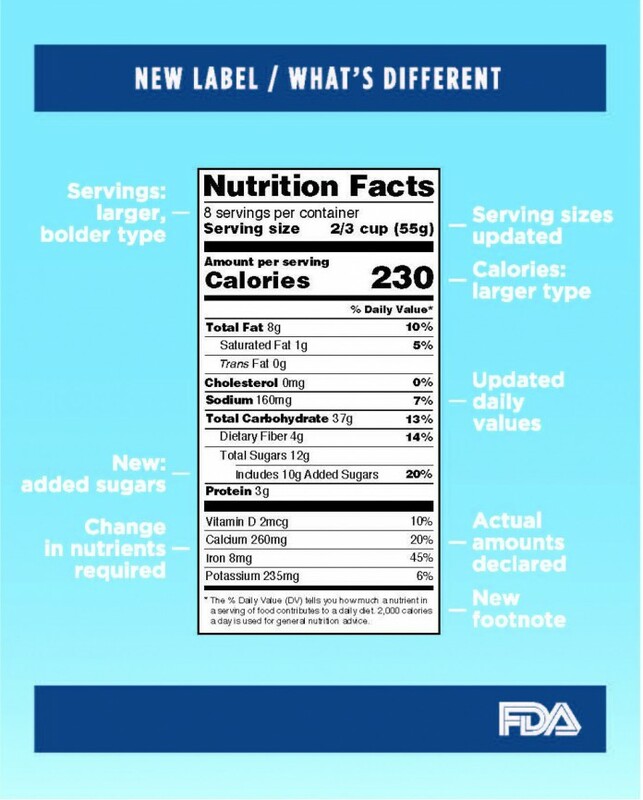 The updated labels will also assign a percent daily value to added sugars, revealing to consumers that, for example, the 65 grams of added sugar in a 20-ounce bottle of Coca-Cola constitutes 130 percent of the daily recommended amount. The policy change, announced earlier this month, marks an undeniably big win for public-health advocates. But how much will the new sugar-added labels change what’s produced by big food companies and what Americans eat? Looking back at the trajectory of trans fat, which joined the Nutrition Facts box in 2006, this could, in fact, constitute the beginning of the end of added sugar. Artificial trans fats, usually in the form of “partially hydrogenated oils,” are now widely recognized as dangerous. Originally, however, trans fats were considered healthier replacements for saturated fats. That began to change in 1990 after a Dutch study found that partially hydrogenated soybean oil raised LDL cholesterol (the bad kind) and lowered HDL (the good kind). Those findings made trans fats appear at least as harmful as saturated fat, if not more. The food industry had come to rely on partially hydrogenated oils to extend the shelf life of packaged goods and to fry foods at restaurants. The industry was not happy with the Dutch study and pushed for the USDA to conduct its own, with financial support from groups such as the Institute of Shortening and Edible Oils and the National Association of Margarine Manufacturers. The USDA study also found that trans fats might be worse for heart health than saturated fats, setting in motion the long fade of the ingredient. In 1994, reversing its own advice from the decade prior, the Center for Science in the Public Interest filed a petition with the FDA to require Nutrition Facts labels to list trans fats with saturated fats. Five years later, the FDA made such a proposal (PDF) and by 2003, it had finalized a rule requiring manufacturers to list trans fat content of more than 0.5 grams as a separate line on the nutrition labels. The final blow came last year with the FDA’s decision to ban partially hydrogenated oils, starting in June 2018, unless a specific exemption is granted by the FDA. Within a few years, it will be virtually impossible for consumers to find trans fats in packaged foods. But consumers had already learned to steer clear even before regulation removed most from the food supply. A 2012 survey found that nearly half of consumers were trying to avoid trans fat. A study by Mintel last year ranked “trans fat-free” as the most important “free-from” claim, with 78 percent of label-conscious shoppers looking for it, easily beating out “GMO-free.” Even though the trade groups bemoaned the new law and filed a petition to get the FDA to allow low levels of trans fat use, the industry has been preparing for partially hydrogenated oil’s day of reckoning for more than a decade. From 2002 to 2009-when the requirement was still only to list trans fats, not eliminate partially hydrogenated oil-trans fats have been reduced or eliminated in more than 10,000 products. Something similar is likely to happen to added sugar. “It is hard for people to know if [added sugars] are in their food without the label,” said Kelly Brownell, dean of Duke University’s Sanford School of Public Policy and an expert in food law and legislation. Once shoppers know, they might not want to buy. “Information like this on the nutrition facts label begins driving consumer behavior, and that in turn drives the industry,” said Jim O’Hara, director of health promotion policy at Center for Science in the Public Interest. How companies will cut sugar content is unclear. Partially hydrogenated oils are often replaced with a problematic ingredient: palm oil. (The substitution is better for consumer health but introduces environmental problems.) Monsanto Co. and DuPont have also come out with genetically modified soybeans that produce healthier oils. No similar replacements exist for sugar. Artificial sweeteners are plentiful but come with their own unanswered questions. “The jury is out on the consequences of those,” said Brownell. Certain foods are likely to be redesigned, said Shea, especially those with healthy connotations. The food industry has similar expectations. “We certainly anticipate that food companies will be under pressure to reformulate,” said Courtney Gaine, president and chief executive of the Sugar Association. She expects breakfast cereals and yogurts, which are close to the 20 percent threshold for total recommended daily value of added sugars, to undergo inevitable changes. “The question will become: Is a product with 130 percent daily value of added sugar going to be able to compete in the marketplace?” said O’Hara. Coke, for example, has 65 grams of added sugar in the form of high fructose corn syrup. Could that, too, go under the chopping block? While Coca-Cola Co. declined to comment, the company has already been pushing smaller packaging, which would cut the sugar in a single serving, as well as the shock of seeing a high sugar total on the new labels. Companies may look for other ways to get creative. “There is likely to be litigation over what is and isn’t added sugar,” said Stephen Gardner, an attorney at the Dallas-based Stanley Law Group and former director of litigation at CSPI. The FDA seems to be trying its very hardest to limit what food companies can do. Gardner points out that the FDA says (PDF) that “Sugars from … fruit juices can be … stripped of nutrients such that they are essentially sugars,” categorizing the popular fruit-derived, nutrient-devoid juices as “added sugars.” It has also clarified that “evaporated cane juice” is sugar, too. Still, following the added-sugar labels with a trans-fat-like ban is unlikely. There are safe levels of sugar consumption, in contrast to partially hydrogenated oil. It’s the unsafe levels, such as those in soda, that are well-documented as increasing the risk of diabetes, heart disease, and other chronic conditions. There are precedents for additional regulation. “What would be best,” said Brownell, “would be some government regulation that requires companies to [reduce added sugars] in some systematic way over time and then everyone would have to do it.” No individual company has to go out on a limb by trying to acclimate its customers to lower levels of sweetness. The British government, he points out, has done something similar with salt. The U.S. food industry would probably balk at the proposal to cut down on sugar across the board. But, just as food manufacturers did with trans fats, the industry would then go back to the labs to figure out how to deal with it. Previous articleIn France, Are Soldiers Outside The Eiffel Tower And The Louvre Really Worth It?